Posted on Mon 9 Nov 2009 at 4:07 PM PST. Filed under Hardware. This is my editing desk: a 2.4 Ghz Core2Duo DELL PC, 6 GB of RAM, an nVidia card, Vista 64 bit, with Sony Vegas Pro 9 32bit (for plugin/codec compatibility reasons), and two monitors. The 28″ one runs the main Vegas interface at 1920×1200, and the secondary 22″ one previews the actual video in 1:1 ratio size at 1920×1080 (so I can see all pixels as they truly are and edit/color-grade accordingly). 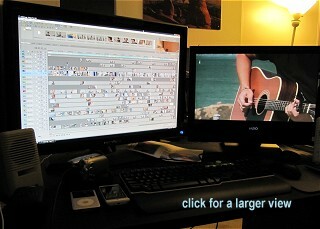 The video project loaded is a music video that I am working on for a Bay Area singer/songwriter. I used 18 tracks there. The look I chose for this video is a green-ish low-contrast look. I am hoping to have the video released by Sunday, after we re-shoot a few scenes on Saturday. On the left side you can see my Canon HV20, 120 GB iPod, and my new smartphone, the HTC Hero. I still need to use better speakers with that PC system though. We have some very good high-quality Logitech speakers in storage, we just haven’t taken them out to connect them. So I am still editing with these $10 speakers (although most of the time I am using some very good headphones, so it doesn’t really matter much).